Today's bento features cute little potatoes I got from Armstrong Valley Farm. Tom grows really great tubers and other veggies. I love his beets, garlic, and greens. These little taters are super tiny and were fun to prepare. 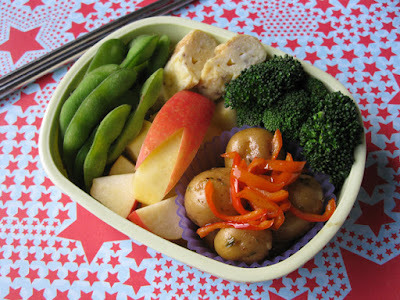 This bento contains: steamed edamame, tamagoyaki omelette, steamed broccoli, apple pieces and an apple "rabbit" made with apple from Lambert's Apples, and boiled potatoes tossed in a taragon vinaigrette topped with sauteed orange pepper from Quivira Winery and Farms. My buddy and I have reviewed another Santa Rosa restaurant on our blog: Two Girls, One Restaurant. 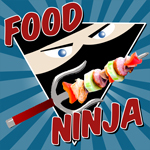 This time we went to a sushi restaurant in Railroad Square. Be sure to check it out and follow us, especially if you are in the Bay Area or plan a visit to Sonoma County. 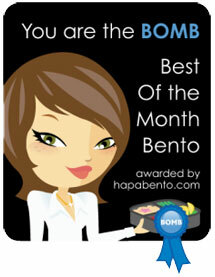 I added this bento to Shannon's What's for Lunch Wednesdays Blog. Check it out for great bento ideas. This bento looks perfect for me. It's beautiful and looks oh-so-tasty! Love it!